Free Video DVD Creator is a lightweight, powerful and rock-solid free DVD burning application that provides users with the best solution to create their own movie DVD. This free movie DVD creator enables you to burn any video format to DVD, including all popular standard and HD formats like AVI, MP4, MPG, MPEG, 3GP, WMV, RM, RMVB, MOV, etc. to playback in your home DVD player, and the output quality is definitely outstanding. Just create your own DVDs freely with whatever video you want! Free Video DVD Creator is your solution. With this free DVD creator software, you can create video DVDs from any kind of video sources like SD/HD, home videos, recorded videos and so on. Then users can enjoy the precious moments recorded by your camera on DVD player. 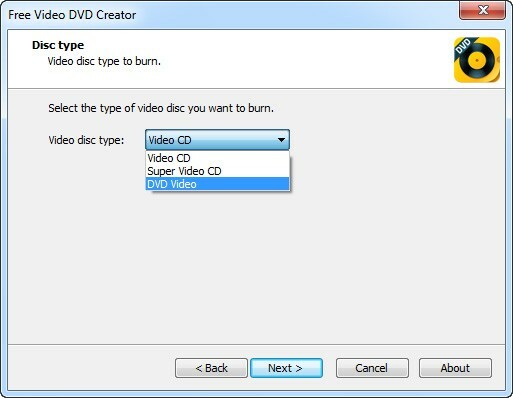 Easy user-interface offers a clear clue for the easy DVD creation. Even novices can handle the whole DVD creation. Free Video DVD Creator helps create a movie DVD from your movie collection, funny video clips, or vacation/birthday party/wedding videotape to share priceless moments with your friends and family. It is also a better way to preserve precious videos by burning them into DVD. It burns Video_TS files which containing a wealth of classic movies and memorable videos to one DVD disc. Now, you can save more space for computer. It is an ideal DVD burner tool to create Blu-ray video discs from high quality resources like HD camcorder videos, iPhone MOV videos and common videos or playback on any DVD players with top image quality and fast conversion speed. This free DVD burner will make life easier. 100% Free and safe, Free Video DVD Creator owns the capability of creating standard VCD SVCD Disc from almost all formats of video files; making a bootable disc to reboot your computer's operating system in emergency cases or to run large programs; supporting DVD-R, DVD-RW, DVD+R, DVD+RW, DVD+R DL & DVD-R DL. With the user-friendly UI, you can easily find and use anything you want in seconds. 2013-10-28 4.3.3 New version may include unspecified updates, enhancements or bug fixes.